Records confirm that in 1277 there was a Chapel of Ease (which is a more conveniently situated church for some parishioners) in Needham Market linked to the mother church at Barking. This Chapel was the predecessor of Saint John the Baptist Parish Church. The Chapel may have been built as a place of prayer for pilgrims on their way to the shrine of Saint Edmunds at Bury St Edmunds. The present building was built between 1458 and 1500 dating back over 500 years to around the time of the Wars of the Roses and early Tudor England. The building of the church was financed by William Grey who was Bishop of Ely from 1458 to 1478. His coat of arms can be seen in the exterior stonework above the priest’s door at the East end of the building. The chapel was built with a “hammerbeam” oak timber roof – one of the finest examples of English Gothic architecture. 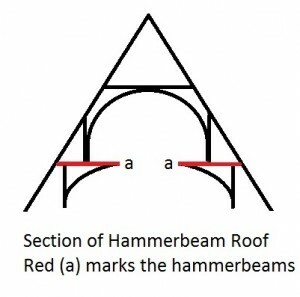 The hammerbeam was developed to overcome the problem of spanning wide spaces – the horizontal hammerbeams projecting from the walls are supported by arch braces and stone corbels. To look up at the roof is like looking down the hull of a ship. 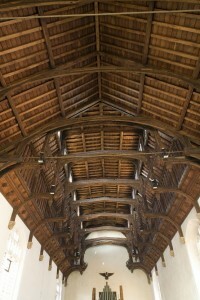 This roof was described by Munro Cautley, the great authority on East Anglian churches, as “the culminating achievement of the English carpenter”. The porch with its ‘spirelet’ was added in 1883 by the Victorians to carry the clock and the bells that we see and hear today. 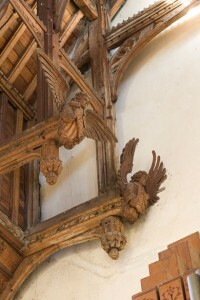 The carved angels, to the projecting ends of the hammerbeams, were added in 1892 in memory of Major William Dods of Uvedale Hall. The current church was elevated to the status of the Parish Church of Needham Market in 1901 and is situated in the middle of town along the High Street. The church is open to the public daily, and has drawn visitors from all over the world to admire this unique part of english heritage. Having stood the test of time for more than 500 years this rare medieval hammerbeam roof is now at risk. A recent inspection found the roof was leaking badly and the wood is being damaged by deathwatch beetle and wet rot. 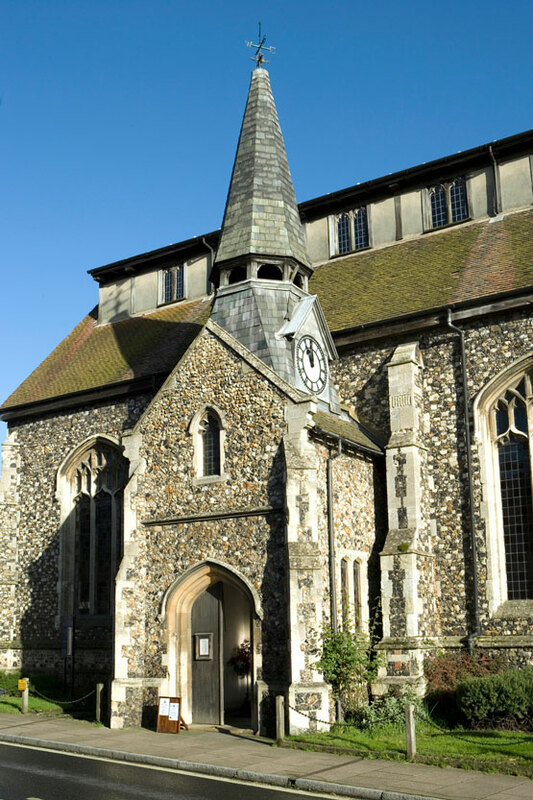 The Parochial Church Council of Saint John the Baptist Church in Needham Market is trying to raise funds for the project to carry out vital repairs to Needham Market’s medieval masterpiece. Please visit www.needhammarketparishchurch.co.uk to find out more.